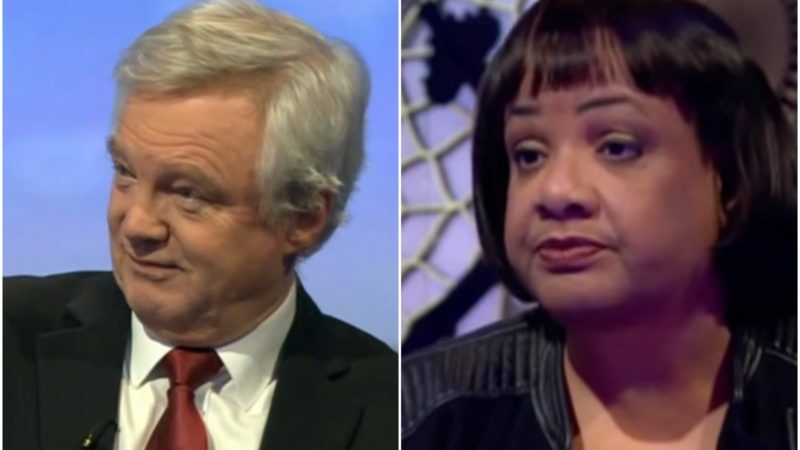 Did David Davis sexually harass Diane Abbott? David Davis (left) and Diane Abbott. I’m afraid it very much looks like he did. It seems the Secretary of State for Exiting the EU leaned in to kiss Diane Abbott in the Strangers’ Bar of the House of Commons after she voted to support the Article 50 Bill yesterday evening. But the gesture was extremely unwelcome and Ms Abbott reportedly told him to go forth and multiply, in the nastiest way possible. Her attitude is entirely understandable. She didn’t want to vote for Brexit but was caught between a rock and a hard place, as many ‘Remain’-supporting MPs were, because of the result of the EU referendum last year. Mr Davis, knowing that, tried to kiss her in what we can only conclude was mocking thanks for her reluctant support of the Bill. Not only is that extremely insensitive on an emotional level but it is also highly presumptuous physically. But don’t just take my word for it – here’s Niamh Ni Mhaoileoin in Left Foot Forward: “This was a senior member of the government engaging in behaviour that violates basic workplace ethics, confident that he could harrass a senior member of the shadow cabinet with impunity. “One of parliament’s longest sitting members? Doesn’t matter. Shadowing on of the great offices of state? Doesn’t matter. There will always be someone who’s willing to humiliate you then ‘walk off laughing’. “In yesterday’s debate, Conservative MPs were outraged to hear Jess Phillips criticising the Tories’ record on inequality, and jumped to defend their supposedly feminist prime minister. Brexit secretary David Davis tried to kiss Diane Abbott in a House of Commons bar last night, so she told him to “f**k off”. The incident reportedly occurred in Strangers’ Bar, a popular watering hole for MPs in the House of Commons. He reportedly “walked off laughing”. Davis is a self-confessed liar and a thoroughly nasty piece of work who is disliked by many of his equally unpleasant colleagues. Whether the “kiss” attempt was mocking or not is irrelevant really. Stupid gesture from a stupid out of touch man trying and failing to be clever and/or funny. I wonder what his wife thinks! Well we only have her word for it, and there could be many different variations of the Story, yet another claim of an ism from Abbott. No, it was witnessed by many people. I like to say typical, but that is not typical,that is moronic, something that seems to be a culture that grows the higher you get in tory land, they tried to research this culture then gave up, they could not afford it,not even 350 mill going to the NHS would find the strain, there are other strains as well, ids, cg,pp, go, bj the list goes on, there must be a gene pool of stupidity or moronic behaviour that this lot comes from, they did identify some of the route traces it came from a place called Bullingdon and then like a bad gene, it spread, it is now known as the tory virus, there is no known cure,they are immune and that just about sums up the thoughts of what some of them are, contemptable, arrogant nobodies. Go on Abbott, make a complaint! Teach the ******* a lesson! There seems to be a dearth of reliable accounts of this (Daily Mirror? WTF?) so it is difficult to see it gong anywhere. If they exist where are they? And without knowing the course of events, no judgement is possible. It is possible to judge Davis as an arrogant man who thinks he can indulge in sarcastically humiliating someone, just because he can. Whether he actually leant in for a kiss, or an air kiss or a hug isn’t really relevant. What is relevant is that Davis saw fit to gloat in very close quarters to Abbott, and she rightly told him to do one in no uncertain terms. Whether it would “go anywhere” is debatable because Tories generally have no scruples to speak of and always stick together when the chips are down. They will make ambiguous remarks, whatever happened. I see it as yet another confirmation that you should never trust a Tory and you should never assume they are really nice smiley people just doing their job. Generally they are not. If they were, they wouldn’t be Tories.